The Tour de Donut will start and end around the square of historic downtown Troy on Aug. 25. 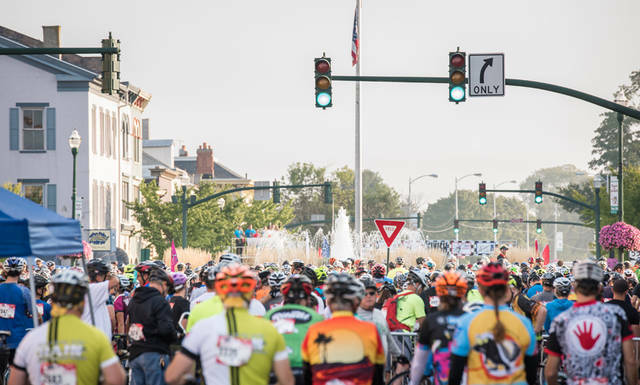 TROY – For its 12th anniversary and its second year in Troy, the Tour de Donut, one of Ohio’s largest bicycling events, is planning an event bigger and better than ever. Known as the “Sweetest Ride in Ohio,” this challenge will start and end around the square of historic downtown Troy on Aug. 25. The inaugural event in Troy brought 2,300 riders, the largest participation number to date. Organizers expect this number to increase as the demand of interested cyclists grows. Being Ohio’s largest one-day bicycle event, cyclists travel to the Tour de Donut from 30 states. New for 2018, the Tour de Donut welcomes Be The Match as its official charity partner. Be The Match invites runners and walkers to participate in the Buckeye Donut Dash. This 5K will begin in downtown Troy at 8:30 a.m. on Aug. 25, running simultaneously with the Tour de Donut. Registration is now open, and information can be found at www.bethematchfoundation.org/TheBuckeye. The Buckeye Donut Dash helps to raise funds for patients in need of a bone marrow transplant. With this support in fundraising, participants help more patients afford transplants, add potential marrow donors to the Be The Match Registry and make more life-saving research possible. The Tour de Donut is a unique bicycle event in which participants’ ability to eat doughnuts is just as important as their ability to ride their bicycle. During this timed bicycle event, riders visit doughnut stops along the course. For each doughnut the rider will eat (and keeps down), five minutes will be deducted from their ride time. The Glazer, a special doughnut stop, will return by popular demand. During this year’s Troy Strawberry Festival, a competition between doughnut shops helped to select the Glazer Donut. The winners include the Classic Crunch from Charlie’s in Celina and the Dream Cycle from Dobo’s in Piqua. These featured doughnuts will be eaten at the final stop and are worth a 10-minute deduction in ride time. Event organizers will offer three different distances for cyclists in 2018. New and improved routes are being designed, free of trains, that will offer riders a fun, challenging experience through rural Miami County. The Donut Mini, a 16-mile course, will return with one doughnut stop. The Mini awards its own prizes and allows younger riders and families to take part in the fun due to the shorter distance. The 32-mile course, the Tour de Donut, will offer two doughnut stops. And, for the experienced cyclist, the Double D Challenge is a 64-mile ride with three doughnut stops. Because registration begins on Aug. 24, an evening event has been designed to welcome riders, runners and residents to this beautiful area. Now named the “Donut Jam,” this event will be the start to a great weekend that will be enjoyed by all. The festivities will begin at 5 p.m. Aug. 24 and will offer something for everyone. First, enjoy a cold beverage with Moeller Brew Barn who will be on site with its many craft beer selections and will feature doughnut-flavored beers to match the theme of the weekend. Many of the downtown stores will stay open late the evening of Aug. 24, with some of the merchants offering sidewalk sales. A performance by the soulful singer Meghna will kick-off the Donut Jam at 5 p.m., followed by Funky G & the Groove Machine. Eating doughnuts is an American tradition and the Buckeye Donut Dash “Donut Eating Contest” will take this tradition to a new and fun level. At 8 p.m., cheer on some of Troy’s finest as they devour large quantities of doughnuts. Ending the night will be one of Dayton’s most popular cover bands, Hey There Morgan. And throughout the evening, children’s activities will include a giant Operation game, miniature golf holes, doughnut-themed activities, a bounce house and an area to learn to kayak. The Aug. 25 festivities will begin early with registration starting at 5:30 a.m. Breakfast foods will be available throughout downtown and at food trucks. Everyone will be gearing up for the 8:30 a.m. start of both the Tour de Donut and the Buckeye Donut Dash. More musical entertainment and children’s activities, along with a visit by the Columbus Zoo, will be a delightful way to spend the morning. Online registration is open. Cyclists should visit www.thetourdedonut.com and runners/walkers should visit www.bethematchfoundation.org/TheBuckeye to get registered. This entry was tagged Tour de Donut, Troy. Bookmark the permalink.